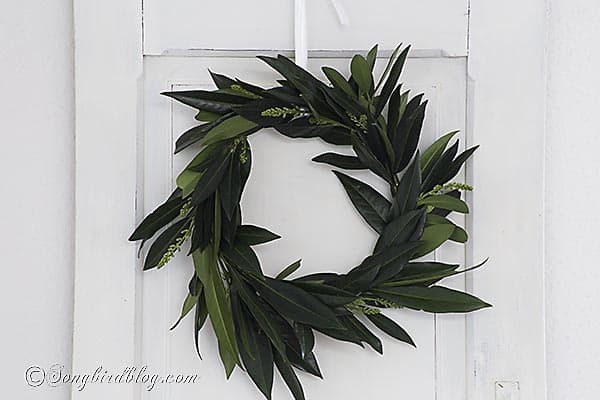 How to make a green leaf wreath. This homemade leaf wreath takes just four simple steps. It is a quick, easy and frugal project that just looks good! Four days in a row and I am still showing projects I made from that one single thrifted old lamp. ….. to be turned into a wreath of course. Let’s see where I left off. After repurposing the lamp stand into a candle stick, I dismantled the old shade into three parts. The first, top part has been used to make a topiary. The second part is now a floating tea light holder. And of course that third part was a simple metal ring, that just begged me to be beautified into a green leaf wreath. And here she is. Hanging on my old door and looking good. 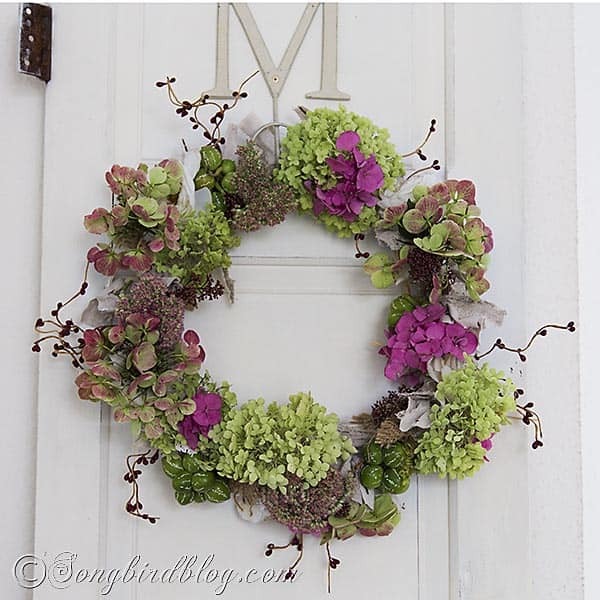 Let me show you how to make a green leaf wreath like this, it is pretty simple and if you use clippings from the garden, it is very frugal too. Gather your materials. Your clippings first of course. I have a laurel bush in the front yard that needed some pruning badly. So I did that and saved the branches for this project. These leaves are a bit wax like, so I am counting on them lasting at least a couple of weeks. Second you need your wreath base of course. Any old metal ring will do, but if you happen to be dismantling a lampshade, be sure to safe the ring and use it. The only craft items you need, is some floral crepe paper tape and floral wire. First order of business, cover that ring. Simply wrap the floral crepe paper tape around the ring. It sort of sticks to itself so you do not need to use any glue at the ends. With the ring now being green, I have to worry less about it being visible. Next step: prepare your clippings. As with any floral arranging a bit of patience is in order. Work with small bits for a much better result. I snipped the tops from my branches so I had nice endings with at least two leaves and a bit of stem. Now comes the fun part. Start building your wreath. Layer your clippings so that the next leaves cover the previously adhered stem. And work your way around always layering your clippings in the same direction. I had to be careful with the floral wire because it would rip right through the leaves. So I weaved it round, making sure I caught the stems tightly between the leaves without pulling the leaves in. Above is the base wreath I made. At this stage I snipped off the wire and I could have left it like that. But I wanted my wreath a bit fuller. I had saved the clippings that were not only leaves but also had a flower. And with little pieces of wire I just tucked them in at regular intervals. Simple, yet beautiful. Just the way I like it. About an hour of my time and no money spent. Perfect little project. Now what will that be. Hang in there and stay tuned and it will all be revealed soon. This is so pretty Marianne! I luv it! I think it is really lovely. I would hang in on my front door anytime. My suggestion/question, why not use floral tape all the way instead of the wire? Also, I’ve read that you can coat your leaves in white glue to seal in the moisture and make it last much longer. Good idea for using all the parts of that lamp–you are very resourceful!